Library Services provides learning resources, study facilities and associated services and equipment to the university community. We take pride in our work and surroundings and endeavour to treat our users with courtesy and respect at all times. The points below outline the standard of service we aim to provide and the standard of conduct we expect from our users in return (see the bottom of the page for a pdf version). Provide you with access to learning resources in a variety of formats which are relevant and appropriate to the university curriculum. Maintain a learning environment which is safe, welcoming, and conducive to study. Offer guidance and instruction in information skills and research skills. Aim to respond to enquiries within 24 hours. Be proactive in seeking and responding to user feedback. Continually develop library collections and services via regular monitoring, evaluation and review. Actively promote library collections, services and facilities via electronic and print media. Be able to present a valid university ID card, or, in the case of external borrowers a valid BGU library membership card. Respect and observe the noise levels permitted in the building’s various study areas (social, quiet and silent). Only remove items from the Library that are for loan and have been issued to their library account. Take personal responsibility for the items they borrow. This includes checking when items are due back and returning them on time; paying any fines that result from the return of overdue loans; and paying for or replacing items which are lost or damaged whilst on loan to them. Bring only lidded drinks into the Library. Food and open drink containers are not permitted. Make or take phone calls only in the stairwells and building foyer. Regularly check their university email account. Ensure that any person in their care and under the age of 18 is supervised at all times and does not disturb other library users. Observe Copyright Licensing Agency regulations as displayed next to each copier-printer. Be mindful of their own and others’ health and safety whilst in the Library. This includes leaving the building quickly and safety in the event of an evacuation. 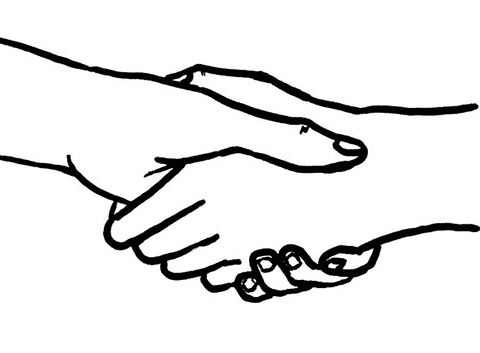 Handshake by Aidan Jones on Flickr under a CC BY-SA 2.0 Creative Commons Licence..